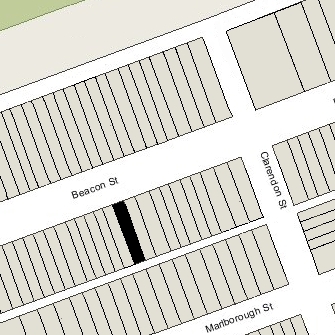 225 Beacon is located on the south side of Beacon, between Clarendon and Dartmouth, with 223 Beacon to the east and 227 Beacon to the west. 225 Beacon was built in 1868-1869 for building contractor George Wheatland, Jr., for speculative sale, one of four contiguous houses (223-225-227-229 Beacon) designed as a symmetrical group. 223 Beacon and 229 Beacon are on 19.5 foot lots and have double oriel windows (to which a third, smaller extension has been added at 229 Beacon), and 225 Beacon and 227 Beacon are on 18 foot lots and have single oriel windows. Click here for an index to the deeds for 225 Beacon. In 1869, 225 Beacon became the home of Copley Amory, a banker and stockbroker, and his wife, Katharine Elizabeth (Chace) Amory. They previously had lived in the Longwood district of Brookline. The house was purchased from George Wheatland on June 2, 1869, by Charles Amory and James Bowdoin Bradlee, trustees of a marriage settlement trust established on June 10, 1865, to hold property owned by Katharine Amory prior to her marriage to Copley Amory. Katharine Amory died in April of 1871, and Copley Amory continued to live at 225 Beacon, joined in 1873 by his parents, Charles and Margaret (Greene) Amory, who had lived at 198 Beacon the previous year. They no longer lived with Copley Amory in 1874. Copley Amory continued to live at 225 Beacon until about 1877. He moved in about 1878, and died soon thereafter, in December of 1879, while living at 50 Beacon. During the 1877-1878 winter season, 198 Beacon was the home of Charles Whitney and his wife, Jessie Grant (Perkins) Whitney. They had married in January of 1877 and 225 Beacon probably was their first home together. By 1879, they had moved to a new home they had built at 181 Commonwealth. By the 1878-1879 winter season, 225 Beacon was leased by Edward Gray, a cotton buyer, and his wife Elizabeth Gray (Story) Gray. They previously had lived at 214 Beacon. 225 Beacon continued to be owned by the Amorys’ marriage settlement trust, and on April 19, 1880, Charles Amory, the surviving trustee, transferred the property to Copley and Katharine Amory’s thirteen year old son, Thomas Copley Amory. The Grays continued to live at 225 Beacon during the 1883-1884 winter season, but moved thereafter to a new home they had built at 293 Beacon. On May 31, 1884, 225 Beacon was purchased from Charles Amory and William S. Draper, guardians of Thomas Copley Amory, by three unmarried sisters: Eulalie M. Iasigi, Elizabeth F. Iasigi, and Mary V. Iasigi. They previously had lived at 43 Mt. Vernon with their mother, Eulalie (Loir) Iasigi, the widow of Joseph A. Iasigi. Elizabeth (Loir) Iasigi had died in December of 1883. In January of 1887, Elizabeth Iasigi married Dr. James Dwight. 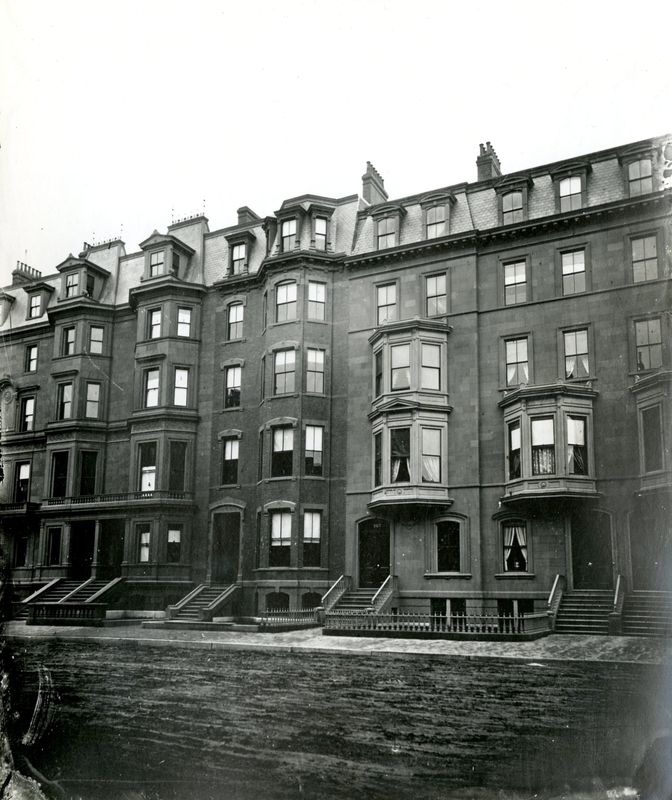 On January 22, 1887, Eulalie and Mary Iasigi transferred their interest in 225 to Elizabeth Dwight and moved to The Kensington (northeast corner of Boylston and Exeter). The Dwights made 225 Beacon their home. James Dwight died in July of 1917. 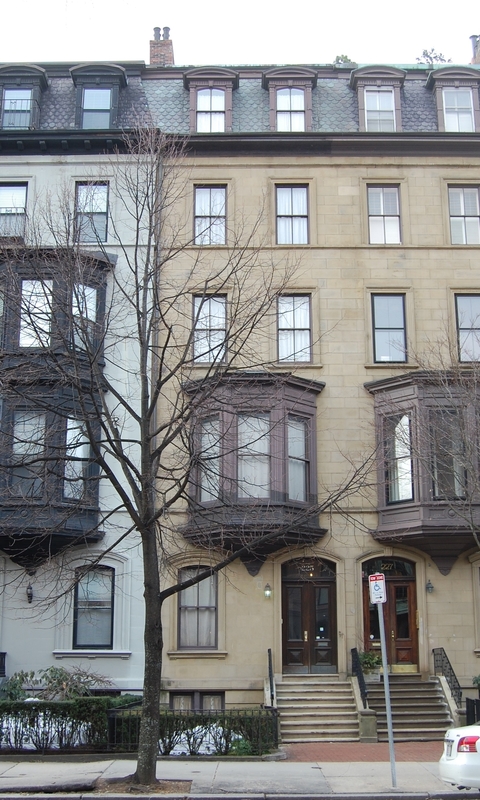 Elizabeth Dwight continued to live at 225 Beacon in 1919, but during the 1919-1920 winter season she was living in Brookline and 225 Beacon was the home of real estate investor Stephen Westcott Sleeper and his wife Eliza Harriet (Cushing) Sleeper. They previously had lived at 336 Beacon, and moved back there by the 1920-1921 season. Elizabeth Dwight was once again living at 225 Beacon during the 1920-1921 winter season, but moved soon thereafter to Brookline. By the 1921-1922 winter season, 225 Beacon was the home of Charles Stewart and his wife Elizabeth Poultney (Pleasants) Stewart. He was manager of the Boston office of Cunard White Star steamship lines. They previously had lived at 4 Louisburg Square. They also maintained a home in East Gloucester. The Stewarts first leased 225 Beacon, but on May 27, 1926, Elizabeth Stewart purchased the house from Elizabeth Dwight. The Stewarts continued to live there until 1940, but had moved to an apartment at 90 Commonwealth by 1941. On June 2, 1941, 225 Beacon was purchased from Elizabeth Stewart by Helen L. (Fairbanks) Lynde, wife of Charles Ripley Lynde, an importer of china and glass. They lived in Newtonville. 225 Beacon was shown as vacant in the 1941 and 1942 City Directories and was not listed in the 1941 and 1942 Lists of Residents. On March 12, 1942, 225 Beacon was purchased from Helen Lynde by Benjamin Miles Ellis. He lived there with his mother, Charlotte (Lottie) (Miles) Ellis, the widow of Benjamin W. Ellis. They previously had lived in Brookline. In 1949, Benjamin Ellis married Rachel Sturgis Codman. After their marriage, they lived at 225 Beacon. Lottie Ellis continued to live with them until her death in 1955. Benjamin and Rachel Ellis continued to live at 225 Beacon in the 1980s. He died in February of 1988 in a rest home in Brookline. On January 31, 1989, 225 Beacon was purchased from the estate of Benjamin Ellis by Diana Walshe. The property subsequently changed hands; it remained a single-family dwelling in 2017.